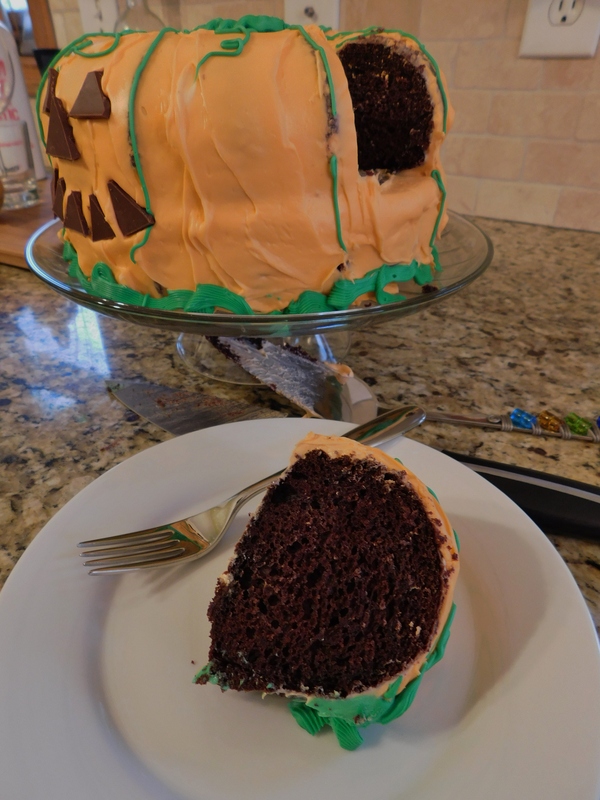 Today’s post is for a Halloween Bundt Cake as I continue my quest to make a year of Bundt Cake using the same recipe and changing it up for each holiday. If you follow this blog with any regularity, you might have noticed that I’ve been MIA for the last 6 weeks. Well, I ended up in the ER one night at 2:00 am and after spending a week in the hospital with a bit of complication from pancreatitis and gall stones, had gall bladder removal surgery. Recovery has been long and tough (in my opinion), but I’m on the mend and hope to be back to posting with some regularity again soon. About a week ago I realized that Halloween was coming up and that I had to get a Bundt Cake done to continue the year. It was a challenge, to say the least. She wasn’t exactly what I had in mind, but I did the best I could under the circumstances. This post will be a bit brief (because this is still exhausting to me right now), but I still think it’s a good idea. Put batter into well buttered bundt pan. Turn cake out onto rack to cool completely. Spoon or pipe over top of cake. Top with sprinkles or colored sugar before glaze dries. I drizzled this cake with a Vanilla Glaze, and I colored half of it with green, the other half I left white. Full disclosure – I had to make the glaze thinner than I usually do because I was too weak to mix it when it was thicker. Ugh. This surgery has really put a damper on things for the holiday season. I sure hope I can get some stamina and strength back before long. Next, I put sprinkles on top, and that in itself was a beautiful cake. It would have been festive if I left it just like that. What I had in mind was more like the malts or shakes that you see all over the internet now, where it’s totally loaded with all kinds of goodies. So I put treats on top. Lots of treats. 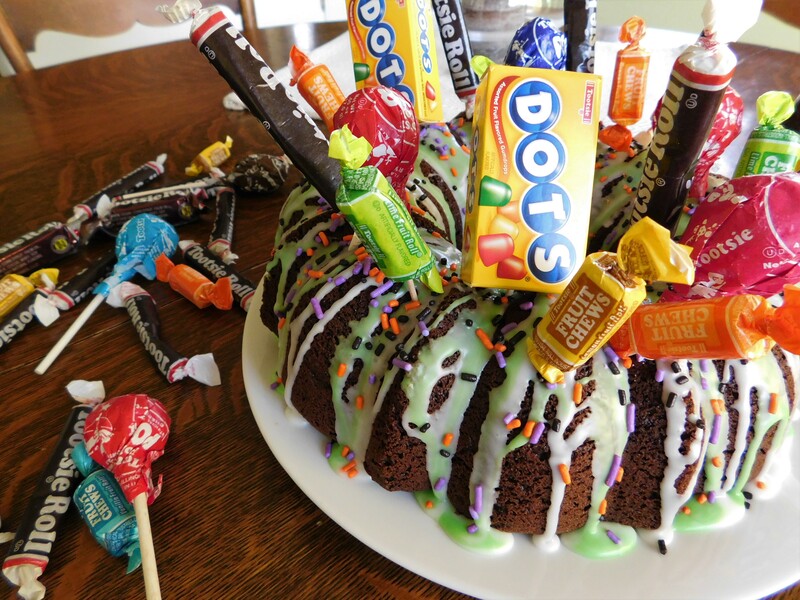 I stuck toothpicks into the bottom of the candies and poked them right into the top of the cake. There were a few suckers that I stuck right in there. There is a fine line between putting the treats on and putting TOO MANY treats on. Too many and they start to tip over – the cake is only so dense. It looks very festive and would be fun to do for a Halloween party, or to send to a college student, or just to celebrate the holiday. 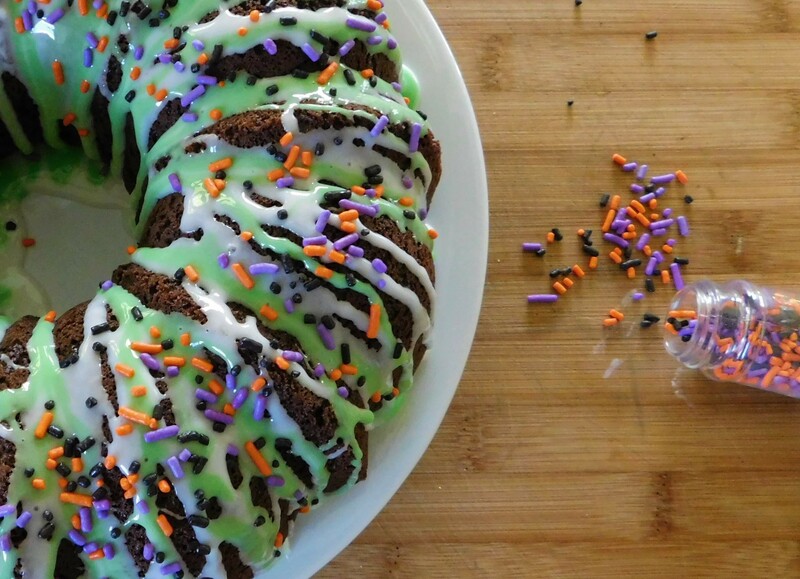 Have a Happy Halloween, everybody, and try this recipe for Halloween Bundt Cake – see how much fun you can have decorating it for Halloween and each and every special occasion! Happy Halloween, everybody!! Stay safe out there! I love cider. You can have cider all through the fall and into the winter. 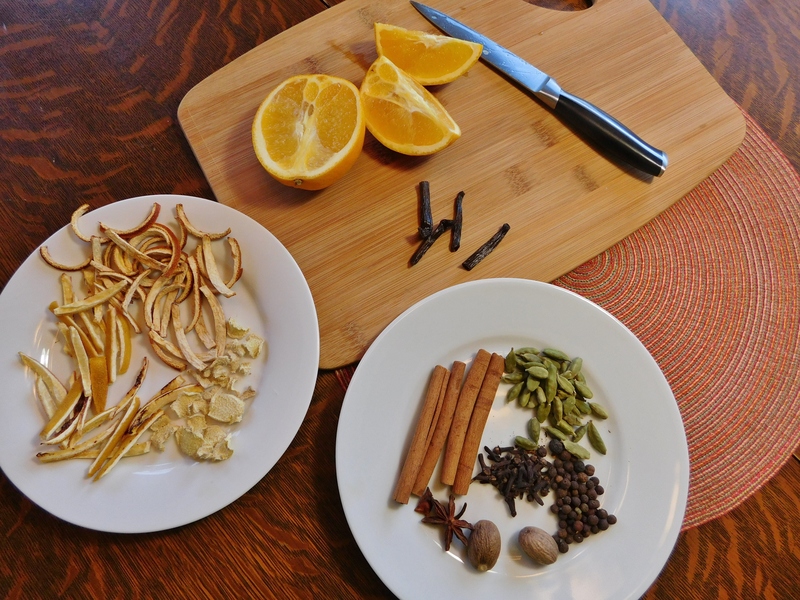 This recipe for Mulling Spices is great for cider, wine, or even tea. It makes a great hostess gift, or even a potpourri. I could see having this sitting out in the living room throughout the holiday season. The scent of it is amazing, and incredibly fragrant. 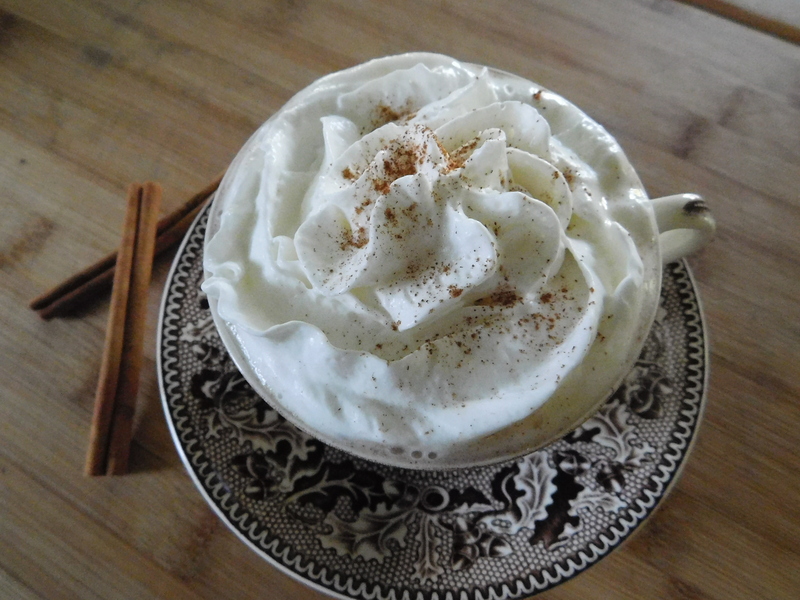 You can really use any combination of spices and citrus rind to spice up your warm beverages. 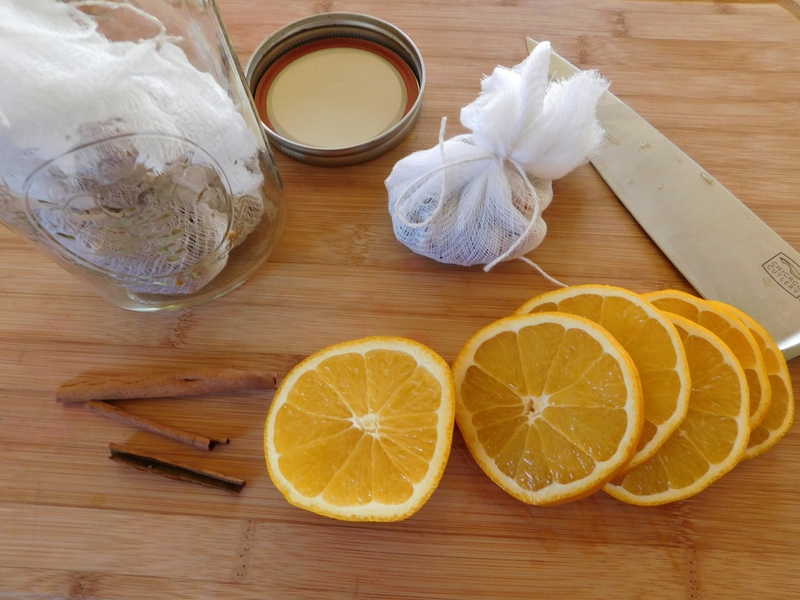 Mix these all together in a bowl, put into cheesecloth or drawstring bag, and give as a gift or use in your beverage. 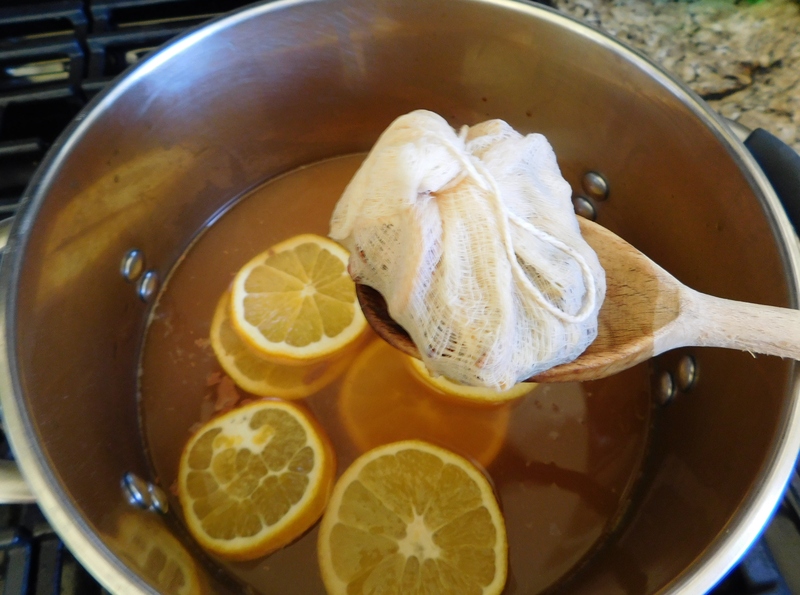 To mull cider: Heat 1 quart cider with one packet of spices and sliced oranges or apples. I love all of these spicy ingredients. They’re pretty enough to have sitting out in a pretty glass bowl. They smell great, too! 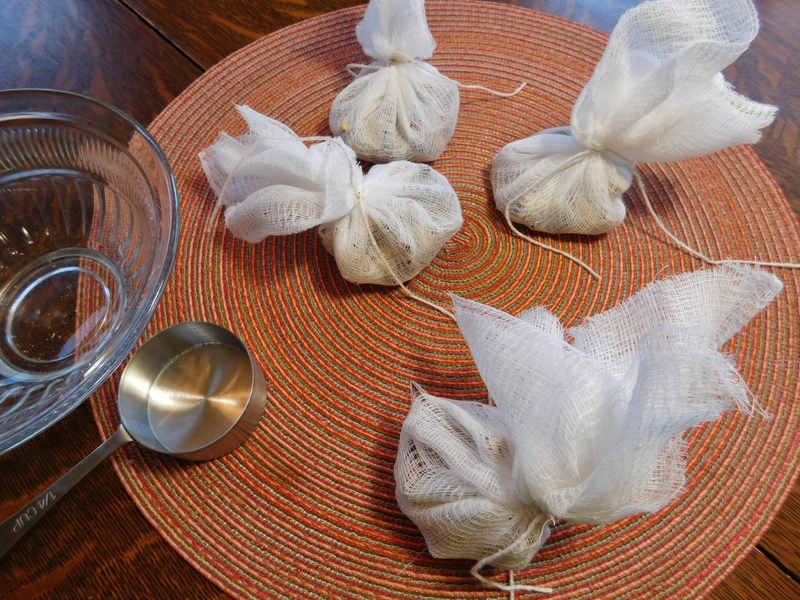 I cut a square of cheesecloth and put about 2 tablespoons of spices into it. 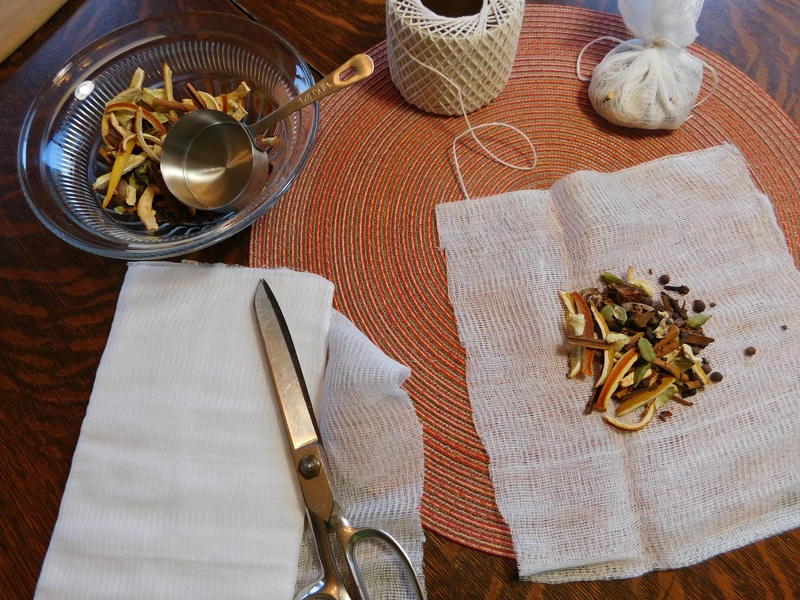 I cut pieces of a vanilla bean and put a piece into each cheesecloth bundle. 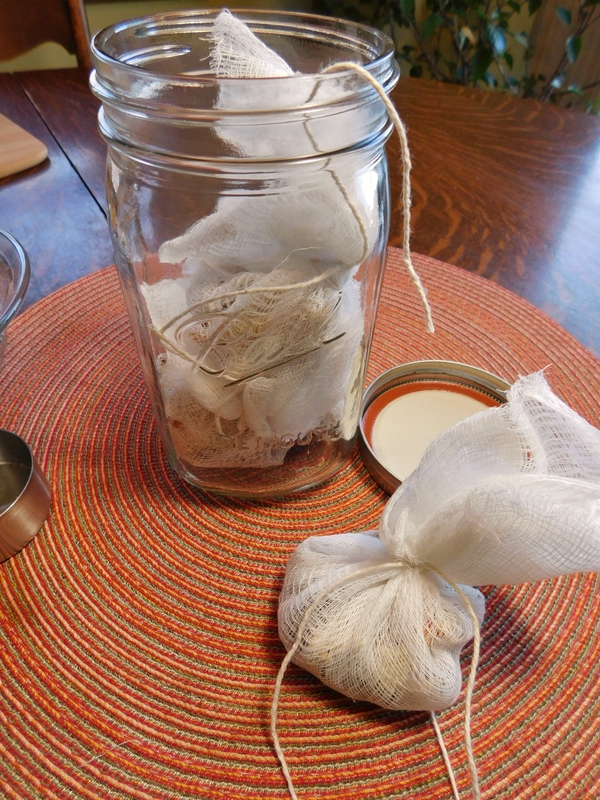 You can find drawstring tea bags online, but I just used cheesecloth and tied it up with kitchen string. The batch I made was enough for about 4 bags. Put them in a jar, put a pretty ribbon around it, and you have a very nice hostess gift for all of your holiday gatherings. 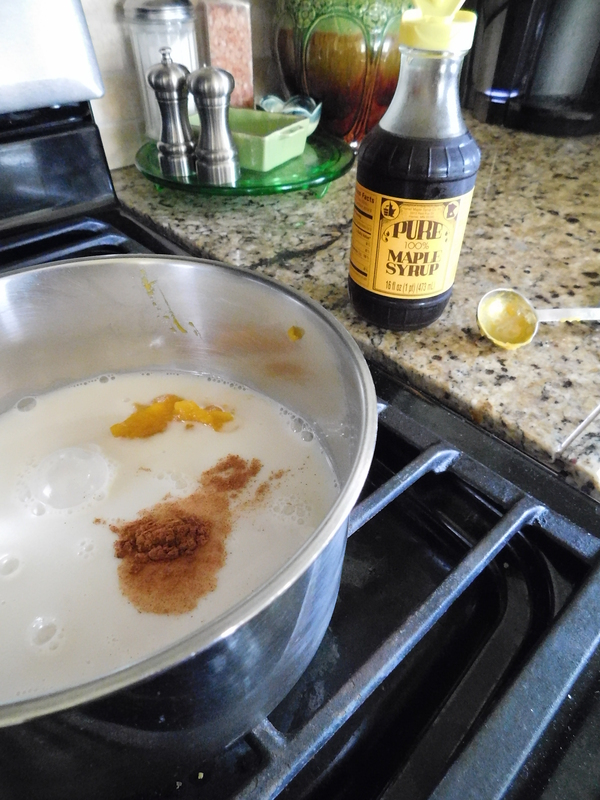 I warmed a quart of cider with a sliced orange and one of the bags of spice mix for about 20 minutes. 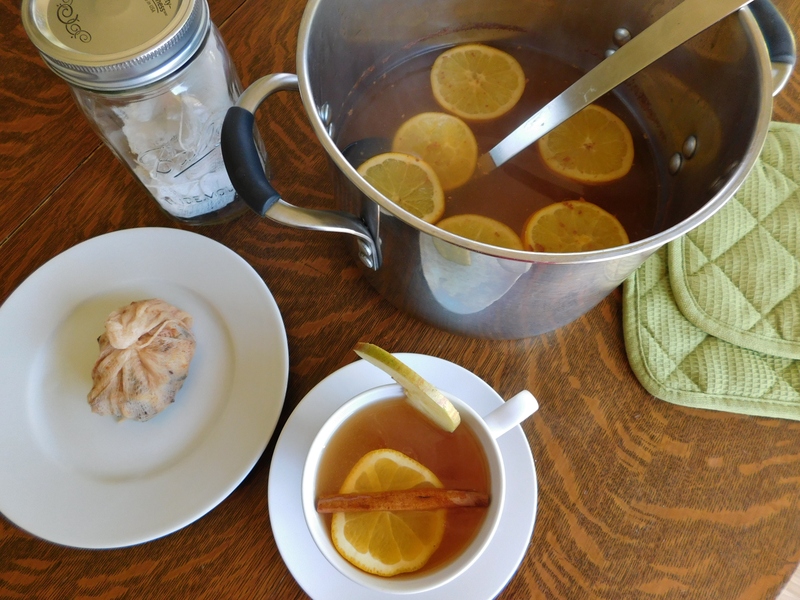 This mulled cider makes the whole house smell like a holiday! 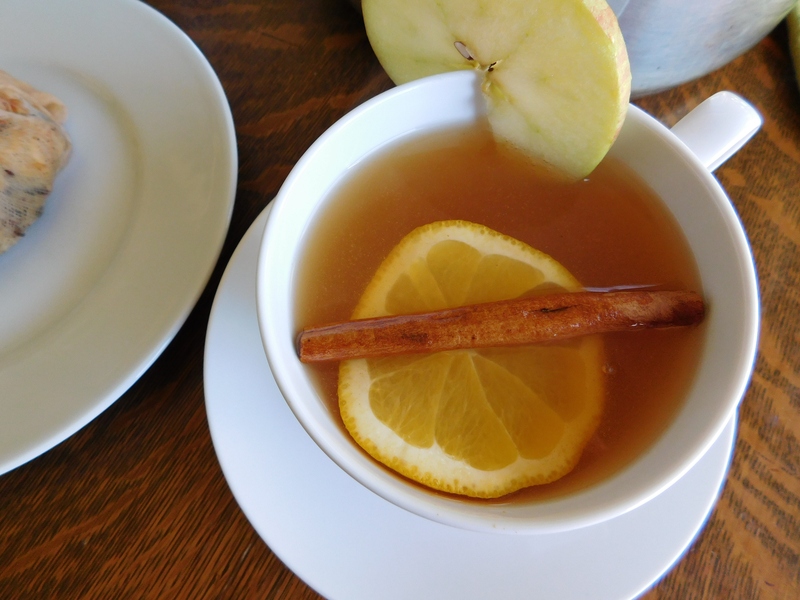 You can garnish your cider with a cinnamon stick, a slice of orange, and/or a slice of apple. Make sure to slice the apple across the middle so you can see the star! 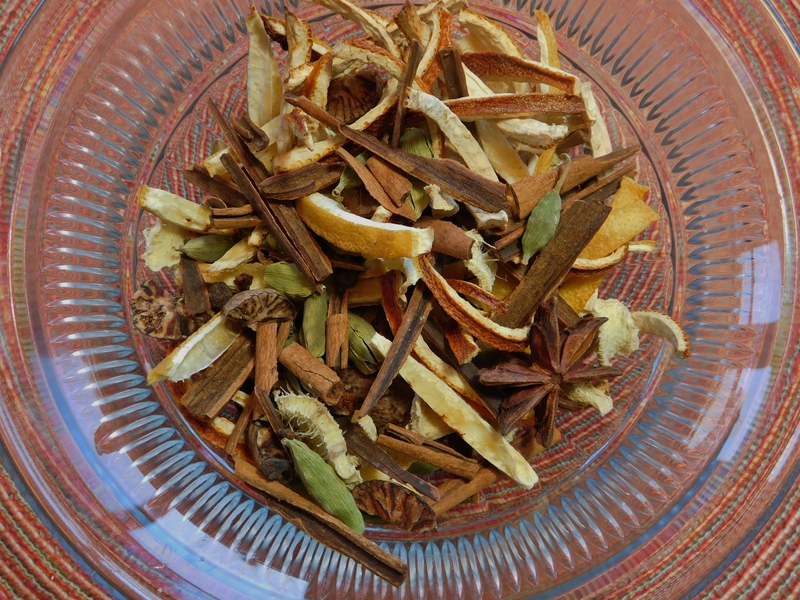 I hope you make this wonderful mulling spice mix. It makes a nice gift – and make some for yourself, too! 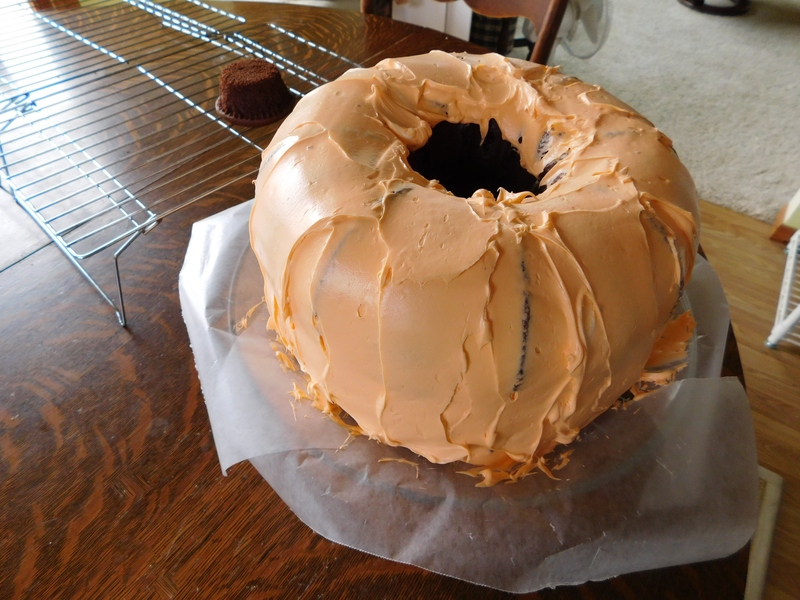 This isn’t a cake made with pumpkin, it’s a cake SHAPED like a pumpkin! I made this cake for years to celebrate my oldest daughter’s birthday. Her birthday is actually the first week of November, but her parties seemed to end up being birthday/Halloween parties during the elementary and middle school years. She’s all grown up now, but since we can’t get together to celebrate during the first week of November, we celebrated on Halloween and she requested a nostalgic traditional Halloween dinner birthday celebration with our traditional Halloween Lasagna and Spider Bread. 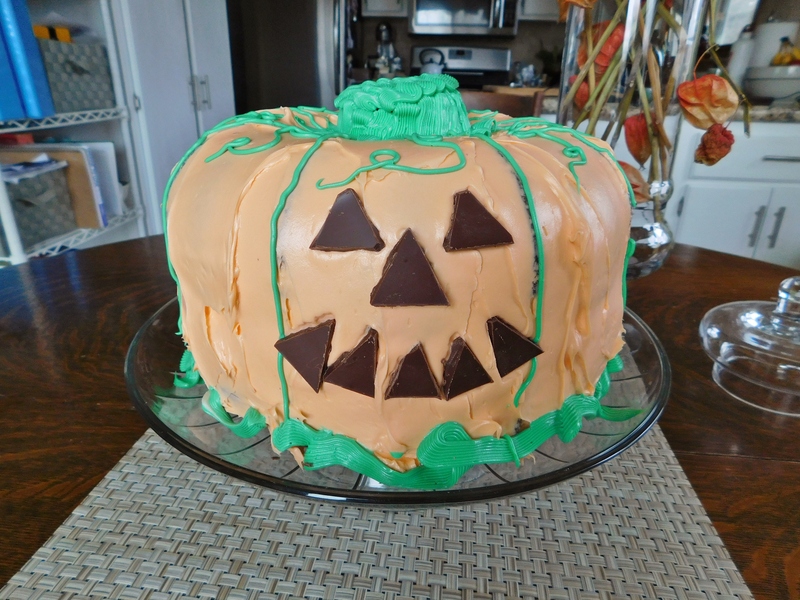 This Jack-O-Lantern Pumpkin Cake was her birthday cake. 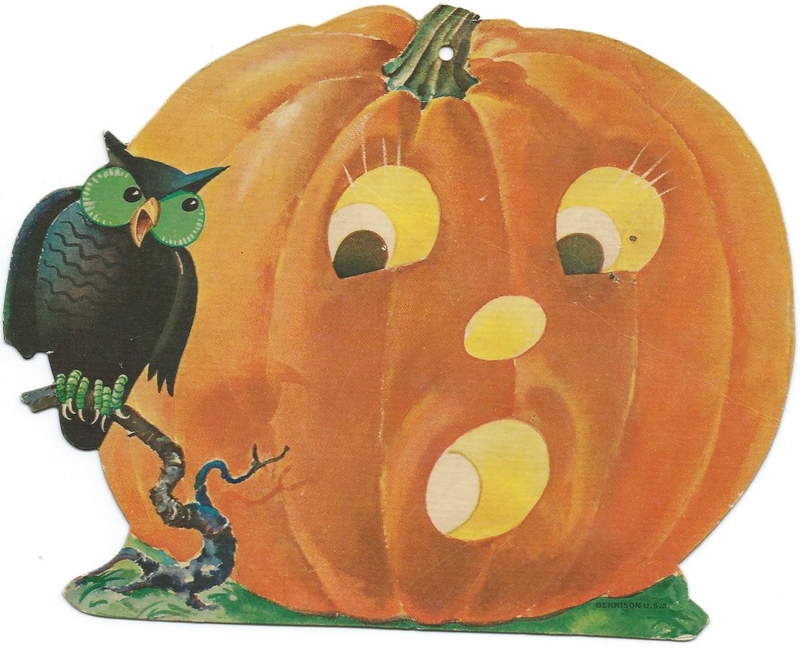 I don’t have an actual recipe for making this pumpkin (because I saw it somewhere years ago and just tried to make one from a photo), so I’ll just type it out here. 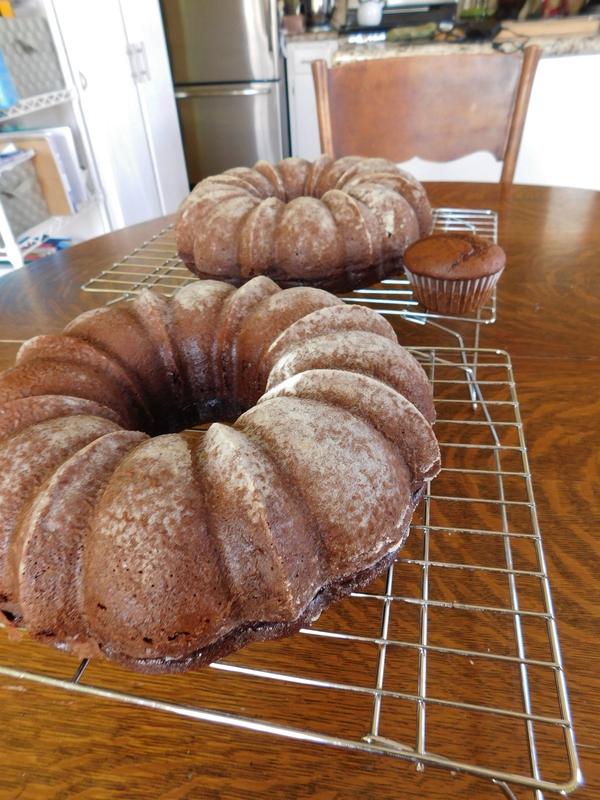 Use 2 boxes of cake mix to bake 2 cakes, baked in a bundt pan according to the box directions. Use enough of the cake mix batter to make 1 cupcake to use as the stem. I use chocolate (this daughter is a chocolate girl) but you could use any flavor of cake mix. 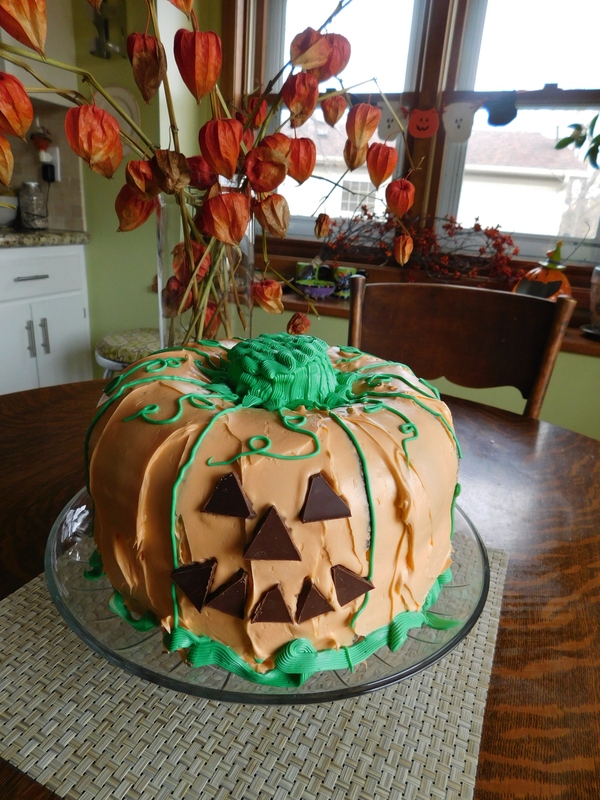 Use 2 containers of Vanilla Frosting (I know, I know – I usually don’t use store-bought, but when I started making this cake years ago, I had 3 children under the age of 10) to make the green or chocolate frosting for the ribs, tendrils and/or leaves, and stem, and the orange pumpkin frosting. For the chocolate or green stem frosting, I add a couple of tablespoons of unsweetened cocoa powder or a bit of green food coloring. For the pumpkin frosting, I used orange food coloring. Use 2-3 Hershey Chocolate Bars, cut into triangles, for the jack-o-lantern face. I usually get at least 2 because sometimes it won’t cut exactly the way you want it to. If you have 2-3 bars, then you have back-up (and I’m sure you can think of something to do with the extra). 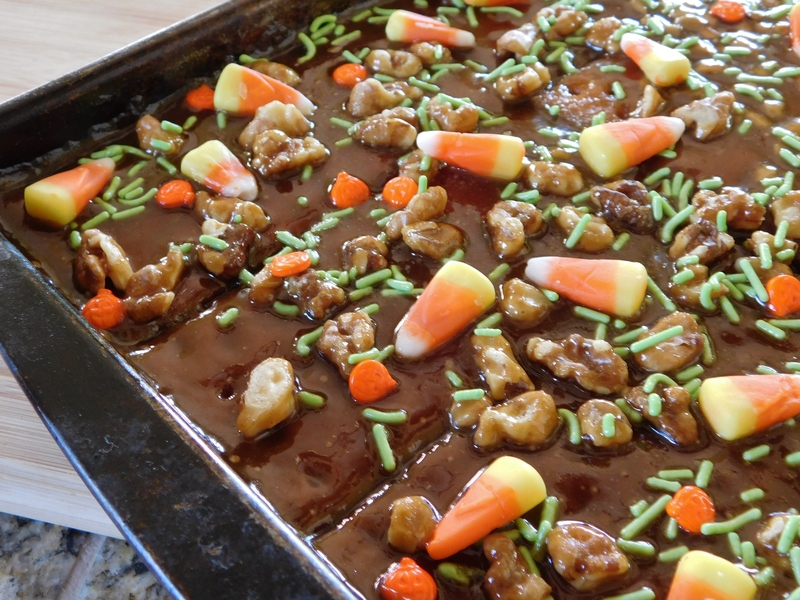 This is also a great cake for Thanksgiving instead of, or in addition to your pies. It serves a lot of people since it’s two cakes in one – just leave off the face! 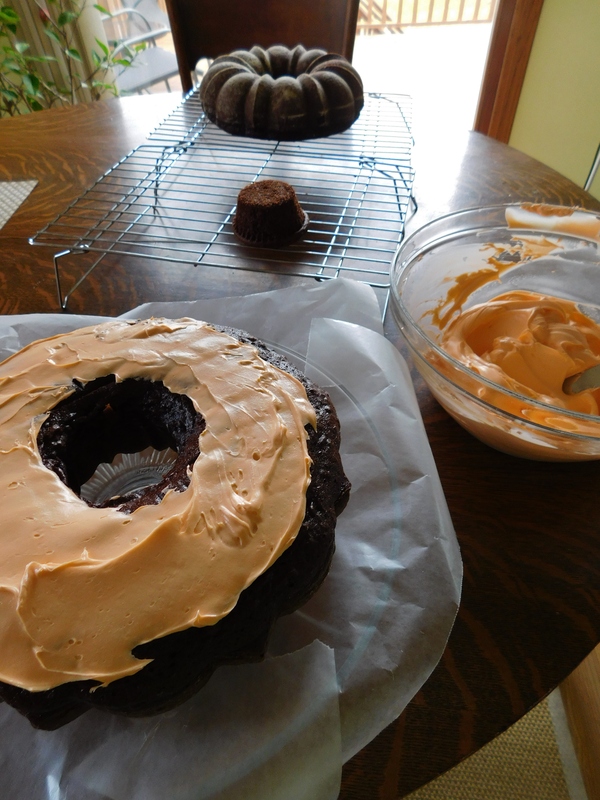 I greased and floured the bundt pan – we want no sticking! In this case, it doesn’t matter if the flour shows since the whole cake will be frosted. Don’t forget to make one cupcake for the stem. Before frosting the cake, I use strips of waxed paper around underneath so you can pull them out later and keep your cake plate clean. You can see how to make this cake plate here. Put the first cake upside down on your cake plate and put some frosting on top of that to stick the top cake on. Put the top cake on and line up the lines of the cake. Then get started with the frosting. You can see the lines of the cake here. I follow them with the green frosting to make the ribs. I also had to put some frosting around the top hole so the cupcake stem wouldn’t fall into the middle. You could also use a couple of toothpicks to hold the stem on as long as you remember to take them out before serving. Then I used a piping bag and put the frosting on the stem, ribs, and vines. You could also use candy corn for the face and to make some decoration around the bottom. 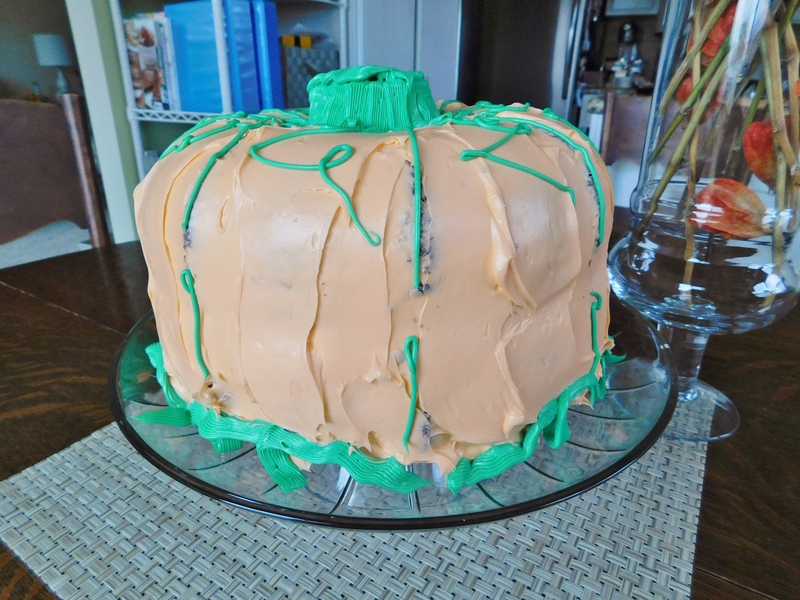 I used the last of the green frosting to make some vines around the bottom edge of the cake. Use a very sharp knife when cutting the face pieces. For some reason, I had a hard time with the candy bar I used. It kept cracking. 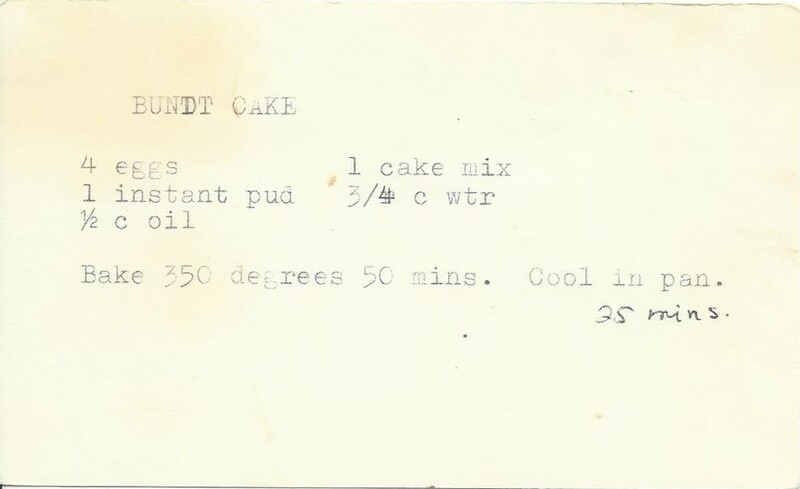 This is also a great cake for Thanksgiving instead of, or in addition to your pies. It serves a lot of people since it’s two cakes in one. Just leave off the face! Decorate it with candy corn or pumpkins. 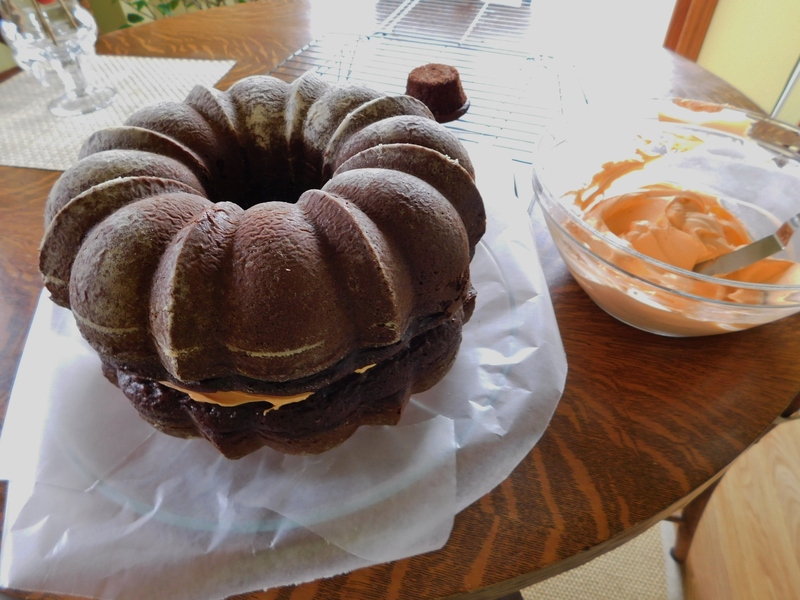 This particular cake used two bundt cakes, but I think you could do the same with just one bundt cake. We’ve had fun with this Halloween/birthday cake over the years. 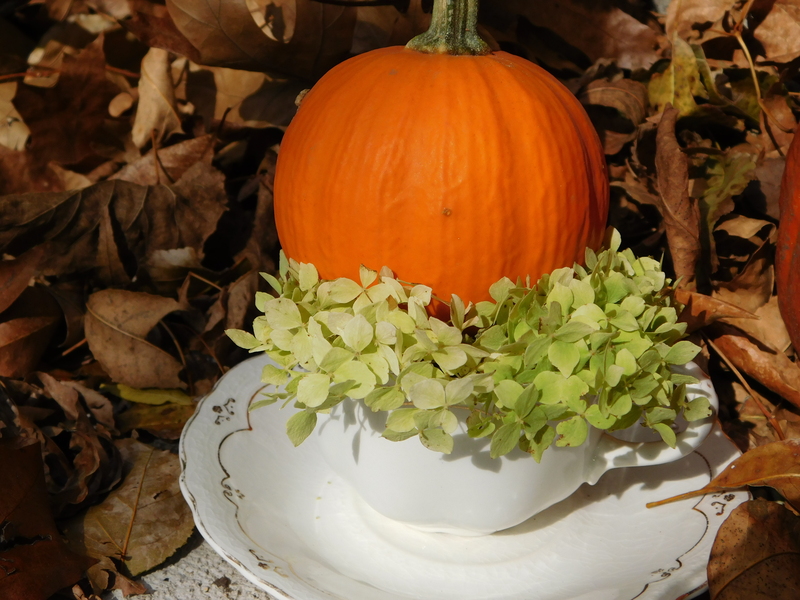 Try this pumpkin cake for your next fall or thanksgiving gathering. It’s fun and festive! Happy Halloween, everybody! I’m sharing a favorite children’s book today, in honor of Halloween. It’s not necessarily a Halloween book, but I love it! 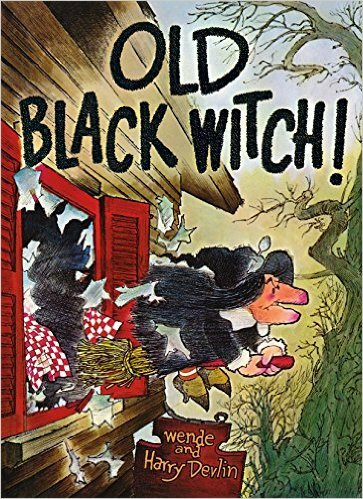 It’s called “Old Black Witch” by Wende and Harry Devlin. You can order it and read the reviews of the book here. It’s the story of a mom and her son who move to New England and open up a tea room. Once they move in, Old Black Witch turns out to be quite the troublemaker. It’s a great story and the illustrations are adorable. 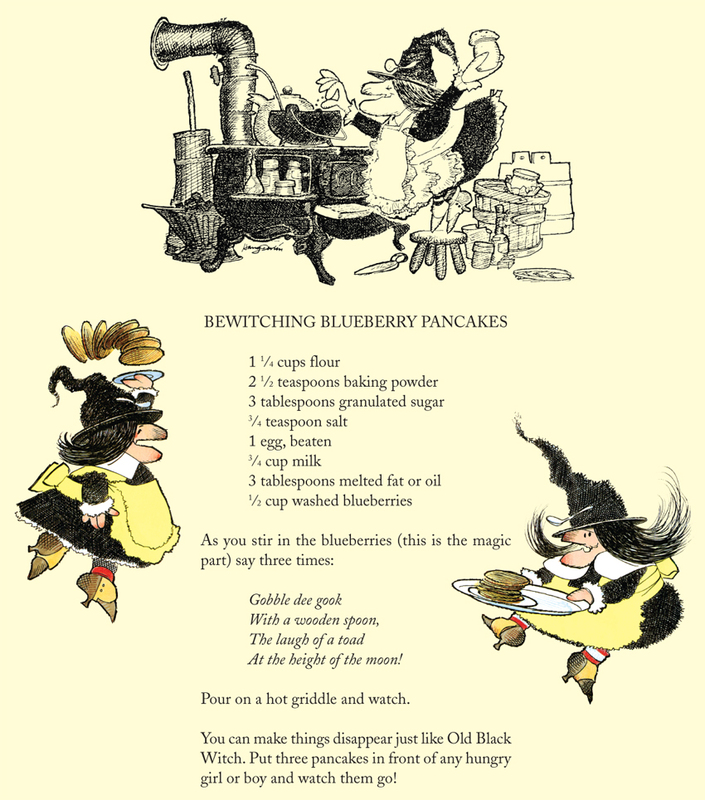 The book even has Old Black Witch’s recipe for Bewitching Blueberry Pancakes on the back cover. It’s a little hard to read the recipe, so I’ll type it out here. At the height of the moon! Pour on a hot griddle and watch. You can make things disappear just like Old Black Witch. Put three pancakes in front of any boy or girl and watch them go! Both kids and adults will love this book! I haven’t tried making these pancakes yet, but I will! I hope you will, too! Enjoy the weekend and stay safe! 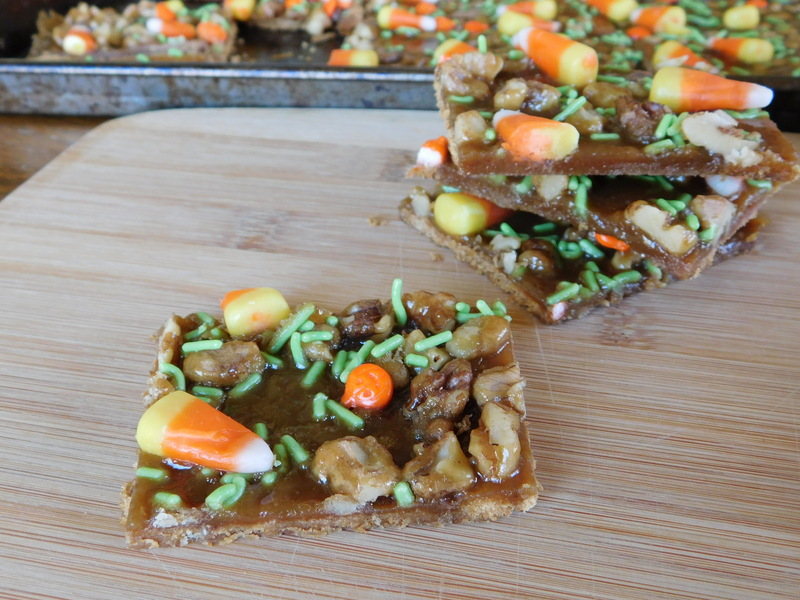 All week I have shared treats appropriate for the season and today I’m sharing a selection of Halloween Treats from past posts! They’re quick and easy to make (and delicious!) and I know you’re going to love them! Halloween is such a fun time of year. It’s always been one of my favorites. I love the smell and sound of the leaves skipping down the street when they’re blown along with the wind – I loved to rake them into a pile as a child and then jump in them and then do it over and over and over and over again. I love the costumes – I was always a gypsy as a child because it was a ready-made costume – one of my grandma’s old dresses, a scarf around my head, and after raiding my mom’s jewelry drawer, I was all set! 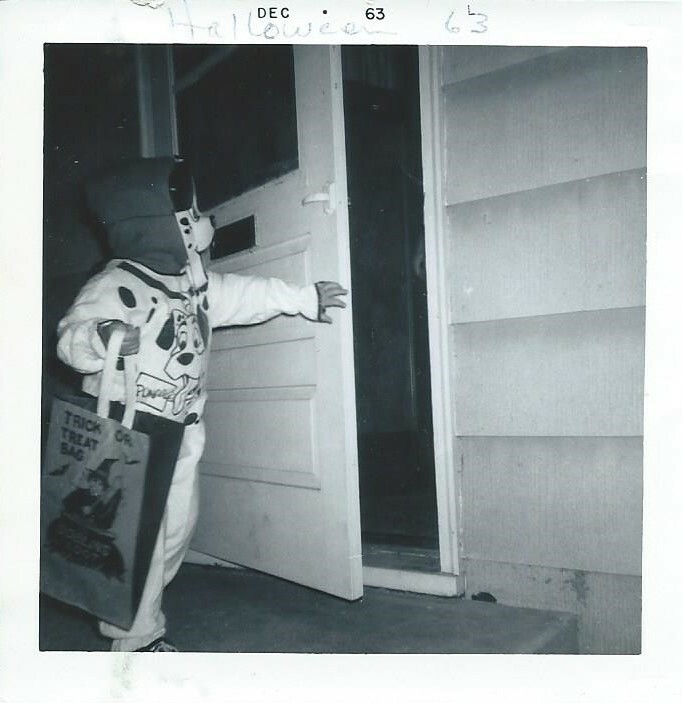 I love the trick or treat aspect – I loved doing it when I was little, except for the year my little sister was sick and couldn’t go and I had to give her half of mine. Now I love to give the treats in some kind of a treat bag that because that always made me feel special when I was trick-or-treating. I love the colors of Halloween and the decorations – I usually try to use natural and vintage decorations instead of going for the blood and gore. 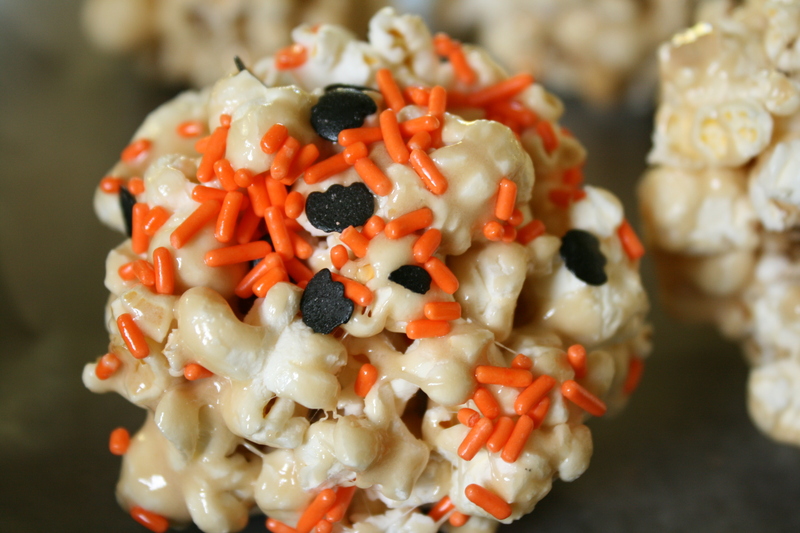 Today’s recipe is another treat that is perfect for fall – all full of caramel and festive sprinkles. 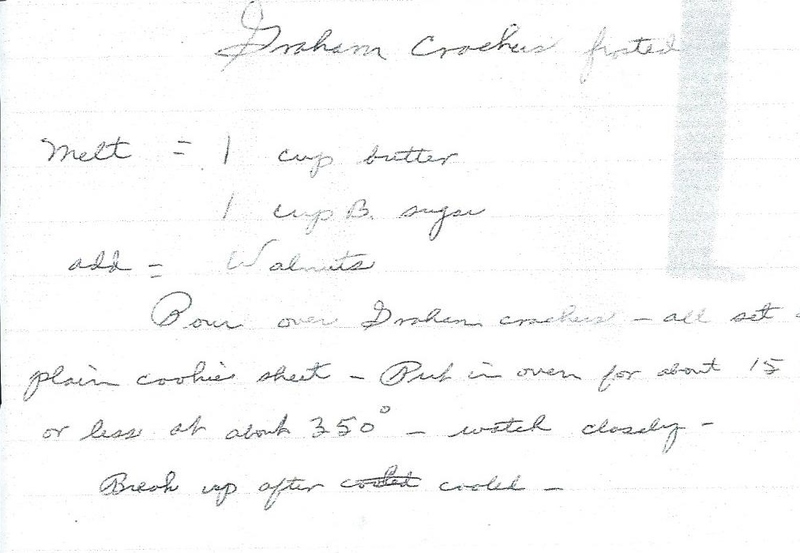 I recently found this recipe for Graham Crackers – Frosted written in Grandma’s handwriting, but in an earlier post, I had done another recipe that came from one of Grandma’s sisters called Graham Cracker Cookies. They are similar, but not exactly the same. So I decided to make this one, using a bit of the Halloween Bark treatment. 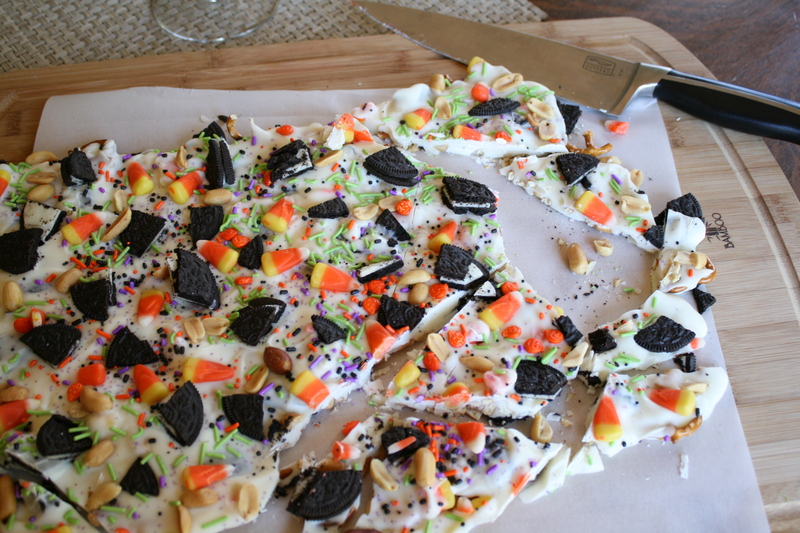 Just like the Halloween Bark, you can dress this up as much or as little as you’d like, in seasonal or special occasion sprinkles or candies. The possibilities are endless. 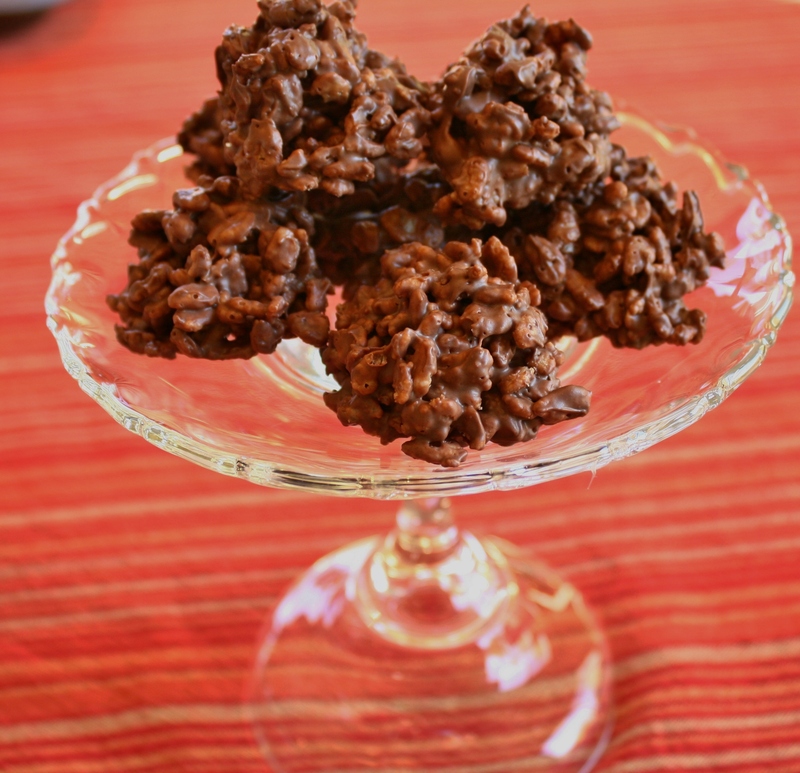 It’s still hard to determine, as with the other recipe, whether this is a cookie or a candy. It really could be either one, but my vote is for a candy. 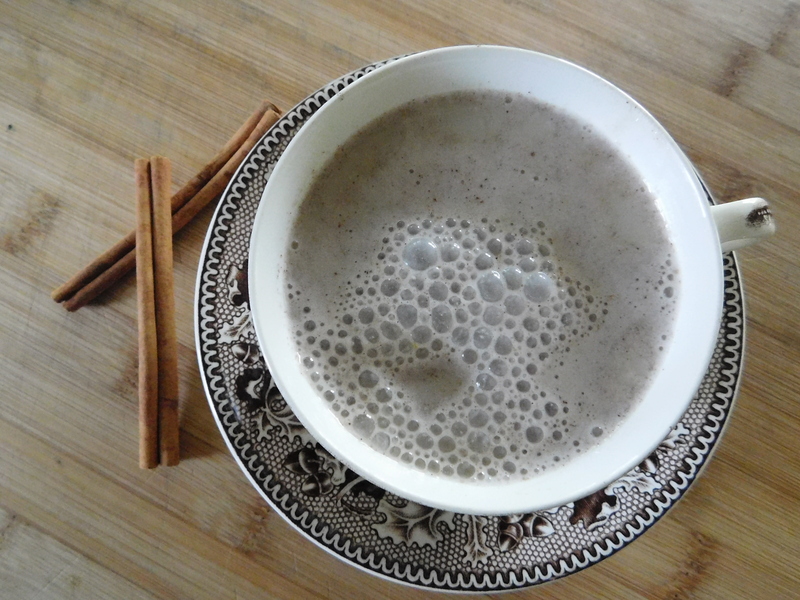 Both recipes are highly addictive. Just sayin’. 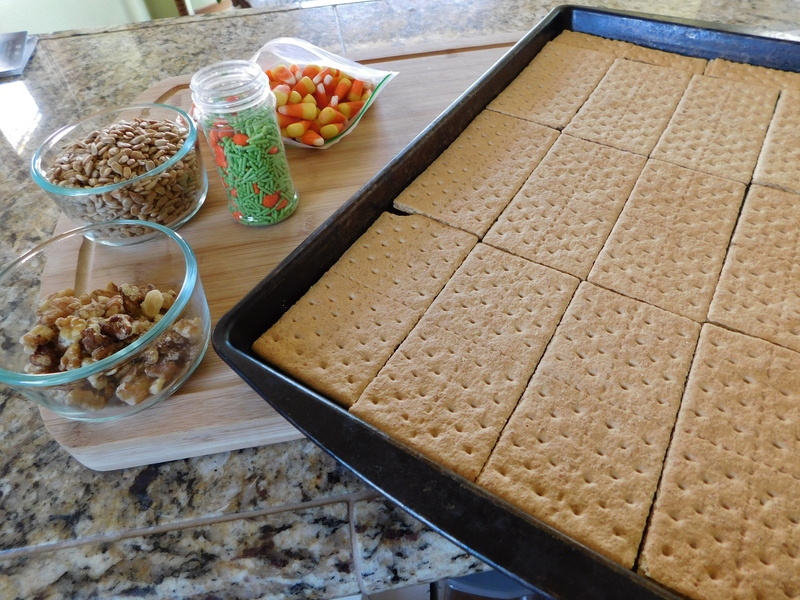 Layer a baking sheet with graham crackers (I used about 1 1/2 packages). 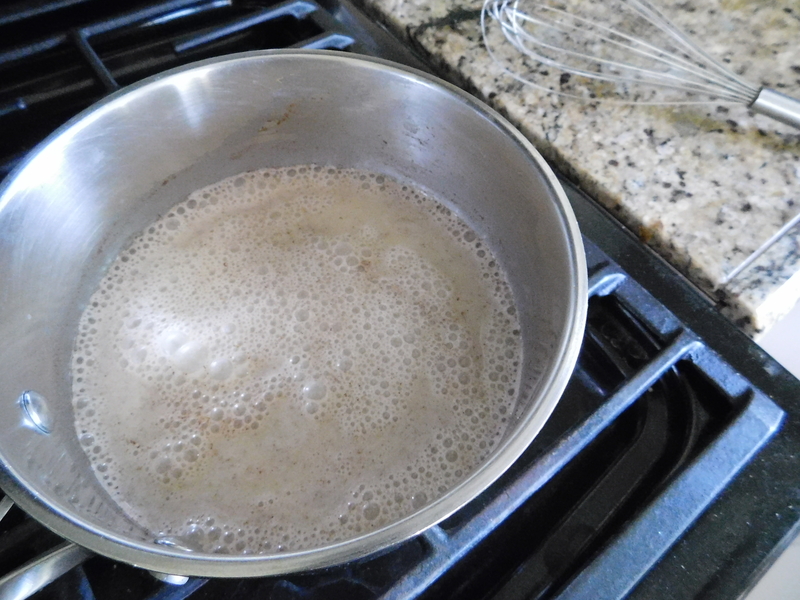 Pour over the top of the graham crackers, smoothing and spreading if you need to. Bake at 350 degrees for 15 minutes or so, watching closely. 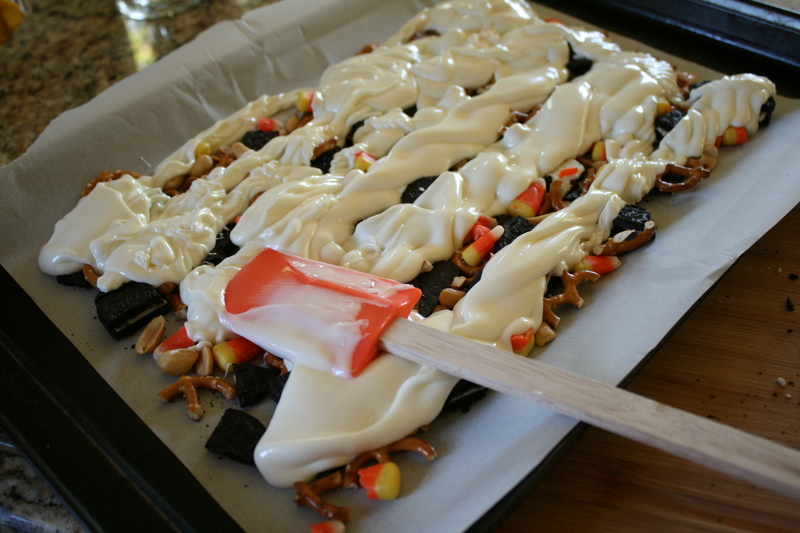 After removing from oven, I immediately put on the sprinkles and candy corn. Break up after it’s cool. I don’t know why this keeps happening, but I ran out of walnuts again, so I had to use some sunflower seeds to supplement. It wasn’t bad. When it first comes out of the oven, it’s bubbling away like molten lava. I let it sit for a couple of minutes and then started the sprinkling. After it’s cooled, you can break it up into pieces or do like I did and cut it on the cracker lines. This candy/cookie is almost like a caramel. 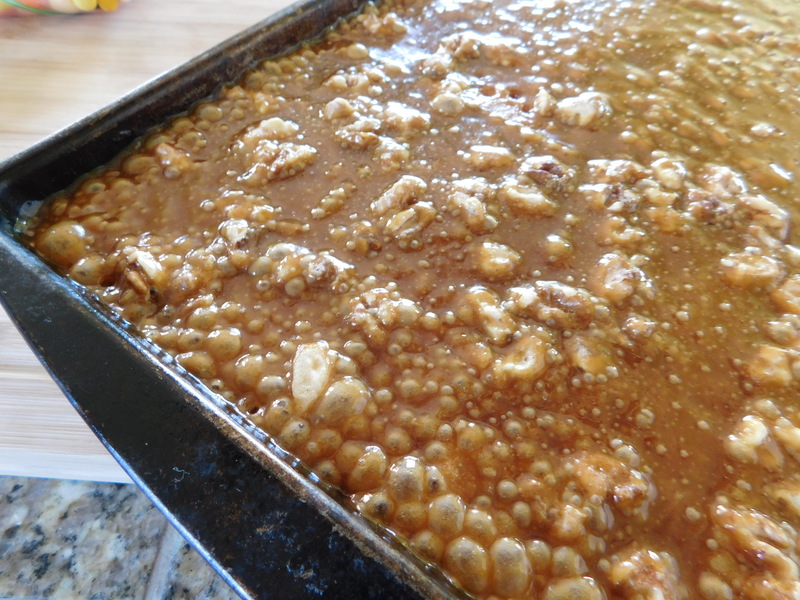 It’s coated with the caramel goodness on both sides and is literally surrounded with caramel! This is so easy and so pretty! Here’s another incredibly delicious candy to try – but be warned – you’ll have to hide it if you want any left by Halloween! These caramel treats are another one that’s highly addictive!!! 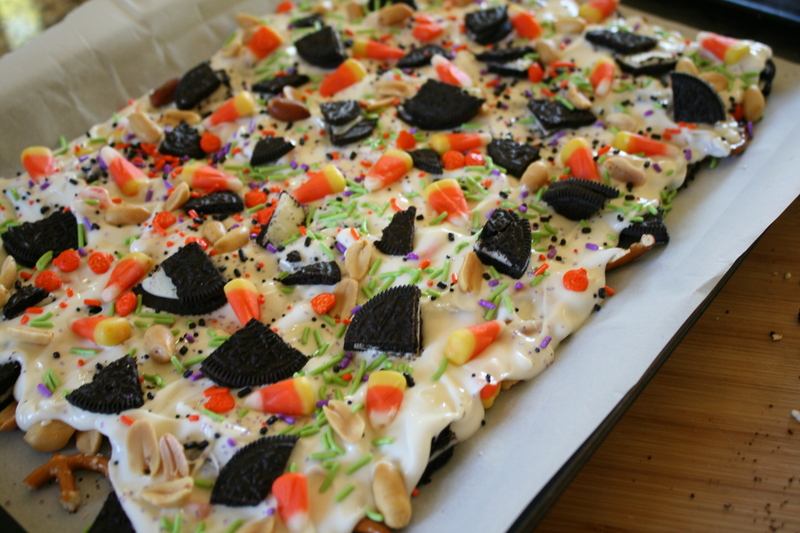 You see this Halloween Bark all over the internet and I thought it was so cute and festive, I just had to try it! It’s similar to the Easter Bark I made a year ago last Easter. This isn’t something you’d eat a lot of (it’s plenty sweet! ), but it’s very festive and can look as much like Halloween as you want. 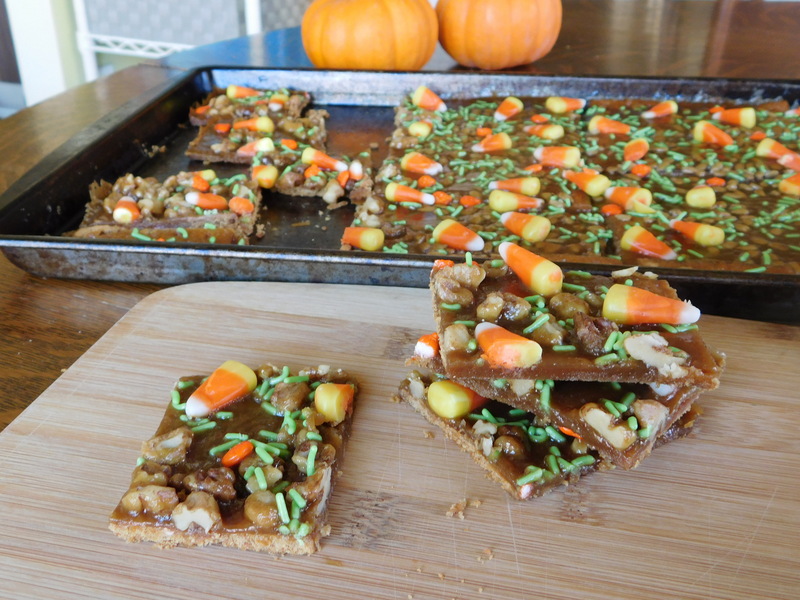 You could also use this as Thanksgiving Bark because most of the colors in it are fall or harvest colors. You could make Christmas Bark, you could make Valentines Bark, you could make Birthday Bark, the list goes on and on. There really isn’t a recipe for this, you can put anything you want in it, so I’ll just type out what I did. 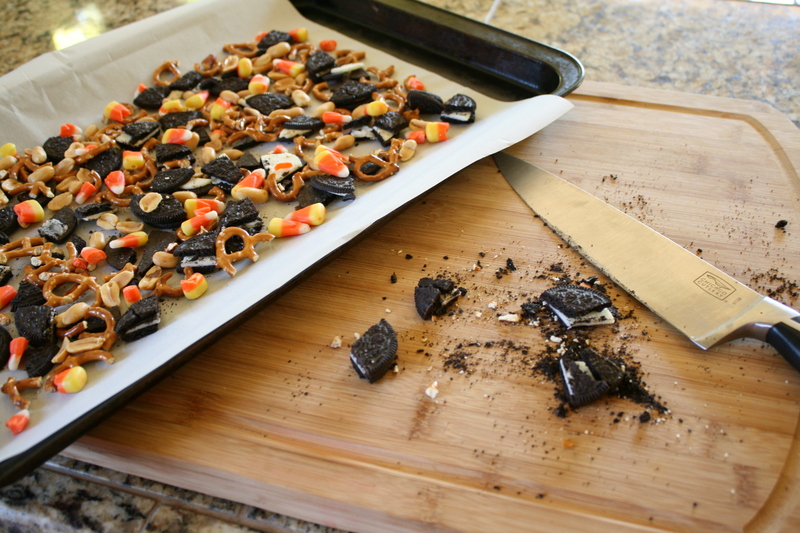 Sprinkle baking sheet with broken up pretzels, peanuts, candy corn, chopped chocolate sandwich cookies, whatever you want in it. Melt one package of almond bark and pour over top. Spread the melted almond bark over the chopped goodies. 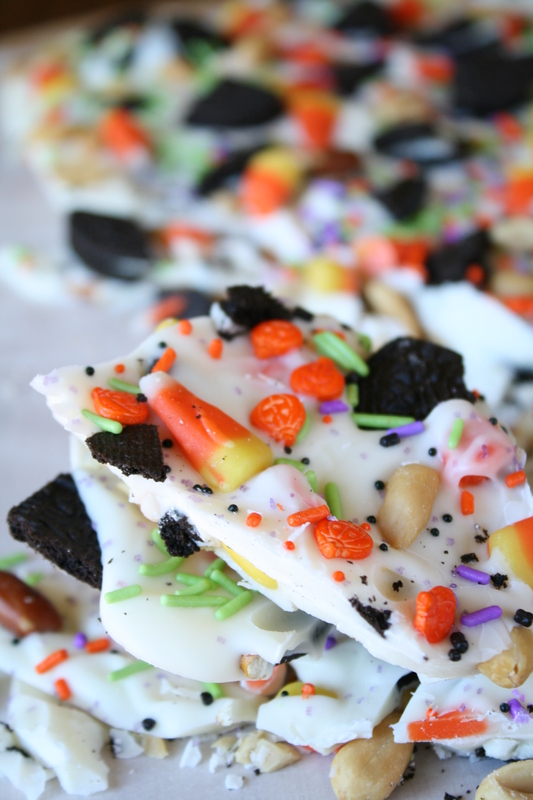 Top with more peanuts, candy corn, chopped chocolate sandwich cookies, and sprinkles of your choice. You can also use the chocolate sandwich cookies with the orange filling. There is just enough almond bark to cover one baking sheet. You can put as many sprinkles and goodies on it as you can! It’s so pretty! It looks like a party! I just love it! This also makes a great Halloween gift or hostess gift. Just put some in a cellophane bag and tie with a pretty Halloween ribbon. It cuts or breaks into pieces very easily. I like the look of the cut pieces. This is really good, but “plenty sweet”! I’m glad I put both pretzels AND peanuts in it. The salty bits make it so good – sweet AND salty! It’s very festive and pretty for the season! 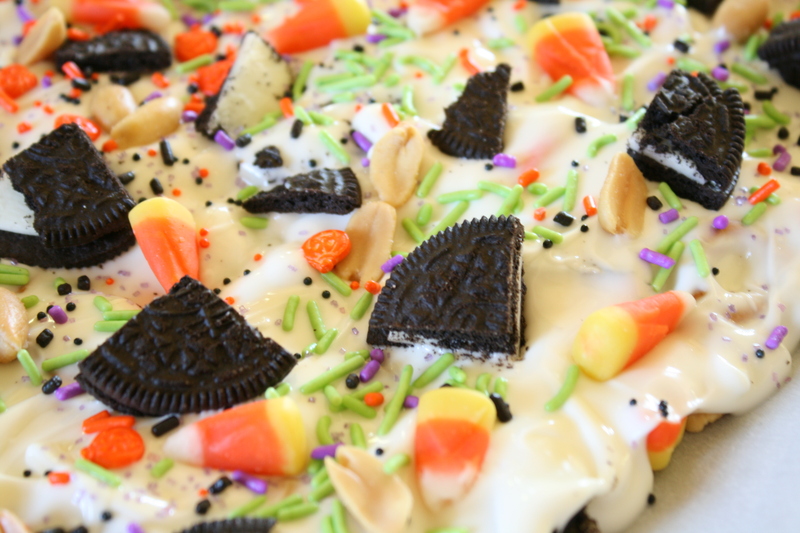 Make up a batch and treat your family and friends – they may “trick” you in return! Happy Halloween, everybody! 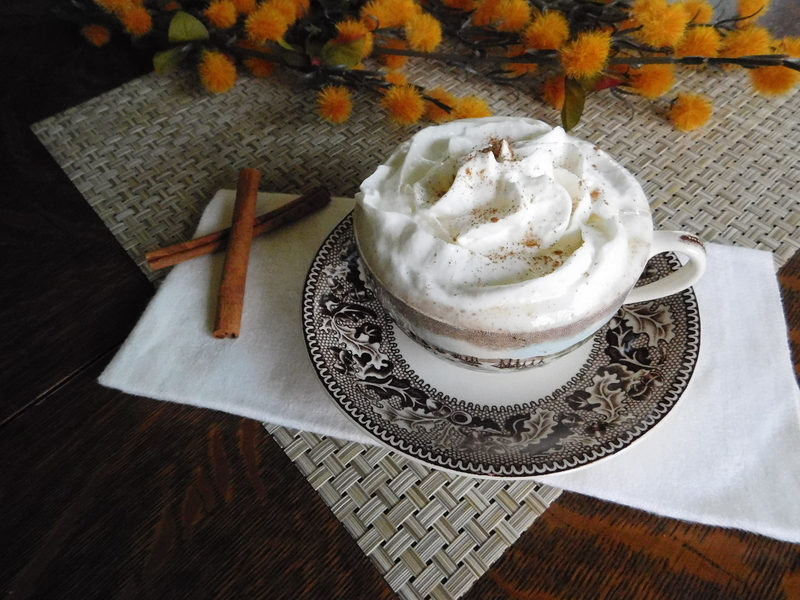 I’m sharing a couple of favorite things today. First, this is the oldest Halloween decoration I have from my childhood. We’ve had it as long as I can remember. Isn’t he cute?!!!! Second, I’m sharing our traditional Halloween dinner. Our oldest daughter’s birthday is the first week of November, so over the years she would have Halloween themed birthday parties. I made this dinner one year for one of those birthday parties and it’s been a tradition ever since. We even managed to have it every year through the college years, not necessarily on the day of Halloween, but at some point during the month. There is no recipe card for the bread – I saw it somewhere once and just figured it out. 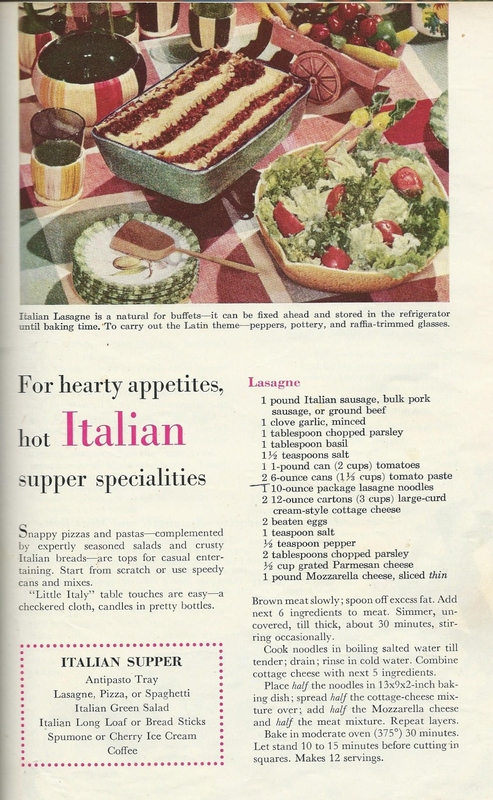 I will show you the recipe for the lasagna. It comes from the Better Homes and Gardens HOLIDAY COOK BOOK for Special Occasions, which was a birthday present I received from our neighbors on my 12th birthday! 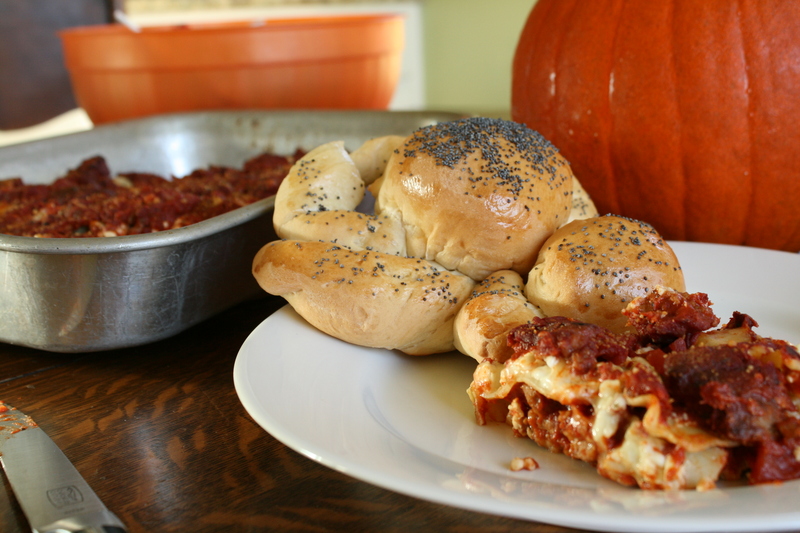 So without further ado, I present – our Lasagna and Spider Bread! This really is a great recipe! Brown meat slowly; spoon off excess fat. Add next 6 ingredients to meat. Simmer, uncovered, until thick, about 30 minutes, stirring occasionally. Cook noodles according to directions on box. Combine cottage cheese with next 5 ingredients. 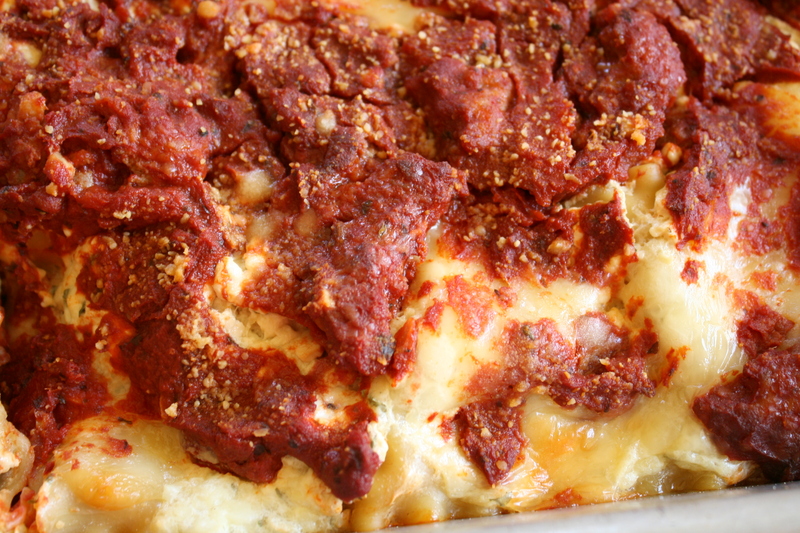 Place half the noodles in 9″ x 13″ baking dish; spread half the cottage cheese mixture over; add half the mozzarella cheese and half the meat mixture. 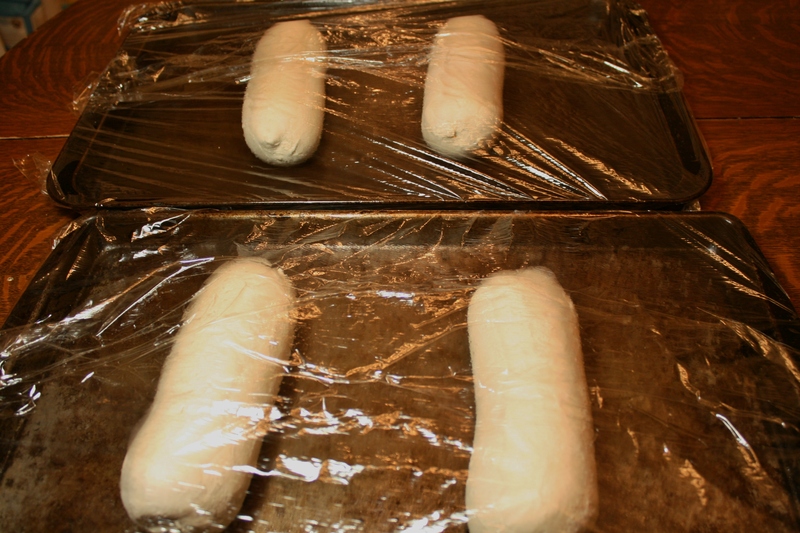 Put frozen bread dough loaves onto greased baking sheet. 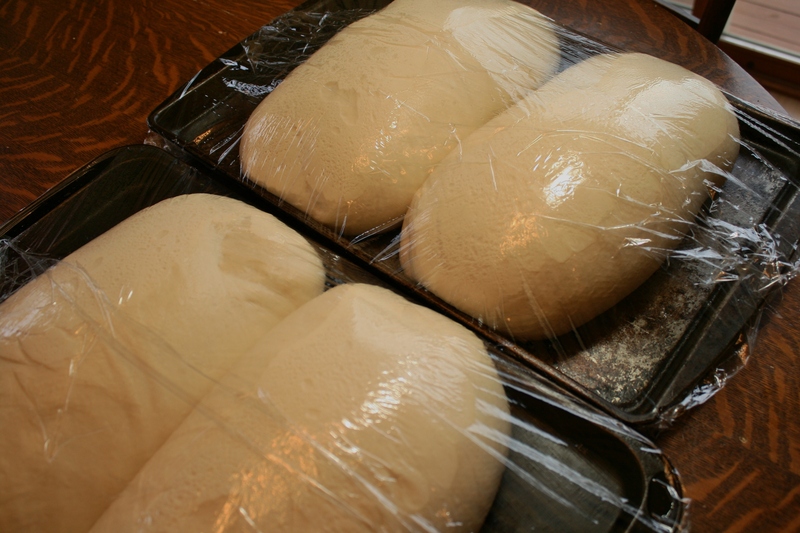 Spray plastic wrap with non-stick spray and cover loaves. Let thaw and rise overnight. 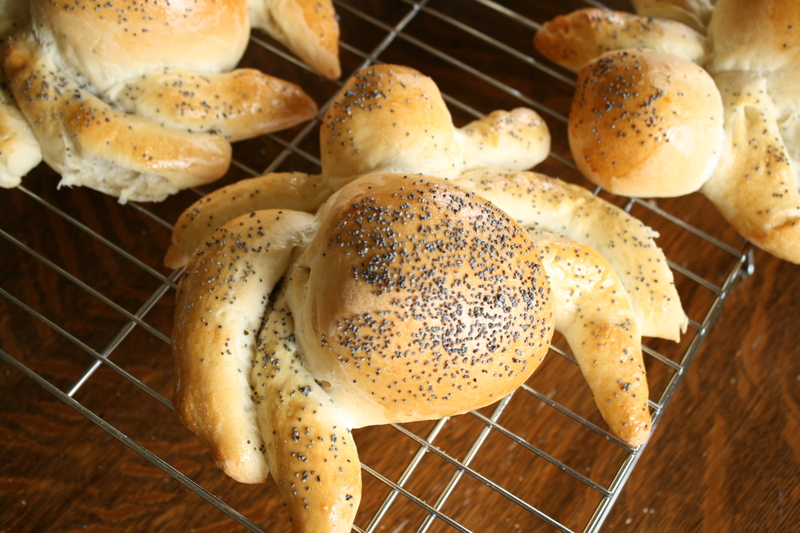 Remove wrap and form loaves into spider shapes. Brush with 1 beaten egg. 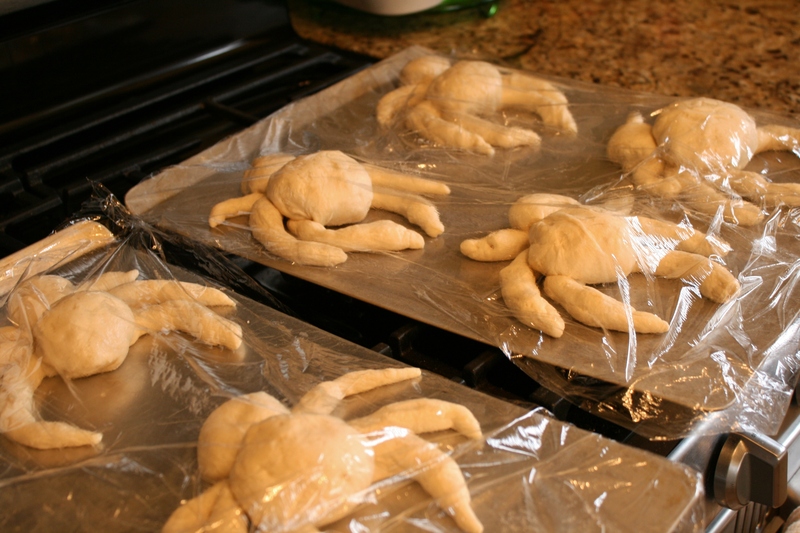 Bake in 350 degree oven until golden brown, about 30-40 minutes, depending on size of spider. 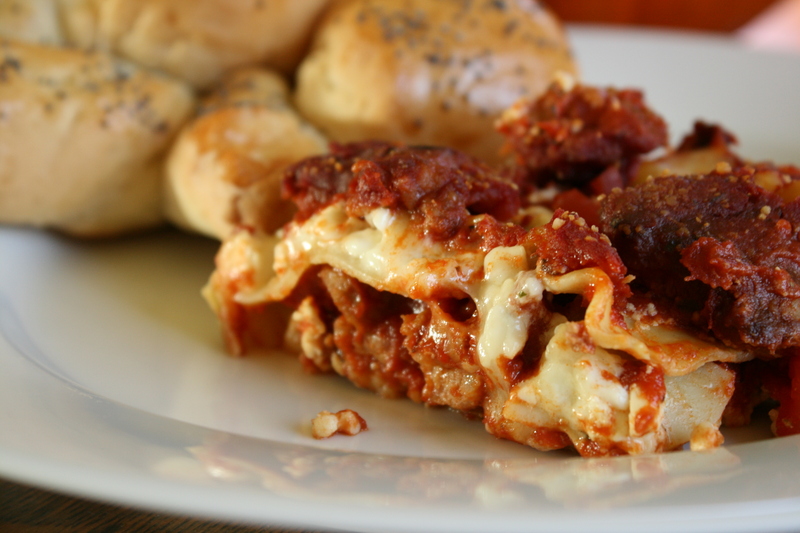 See how cheesy and delicious the lasagna becomes after baking! I use frozen bread dough (I did make this with 3 children, originally), but you can sure make your own bread dough to use if you want to. 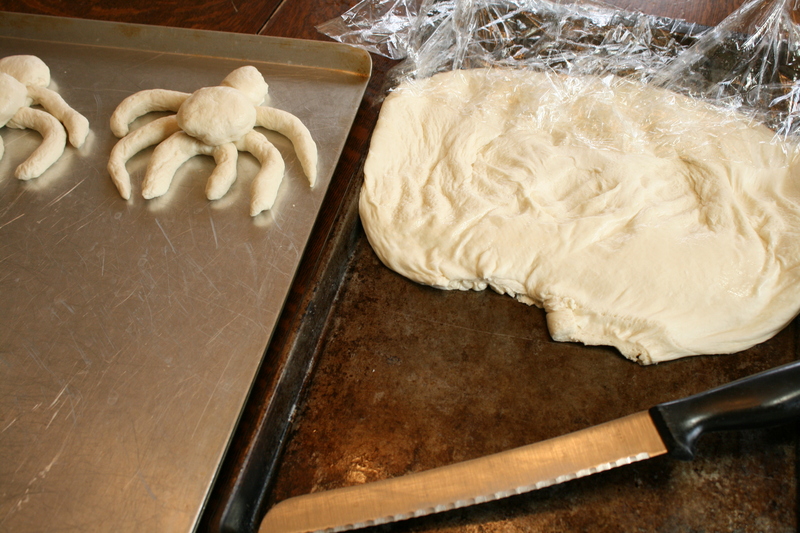 The dough is puffy and bubbly, so you have to punch it down before forming the spiders. I use the same plastic wrap to cover them while rising. They come out puffed and golden and hairy (the poppy seeds are supposed to make them hairy looking) and not too scary. Add a green salad and you have the perfect Halloween meal. 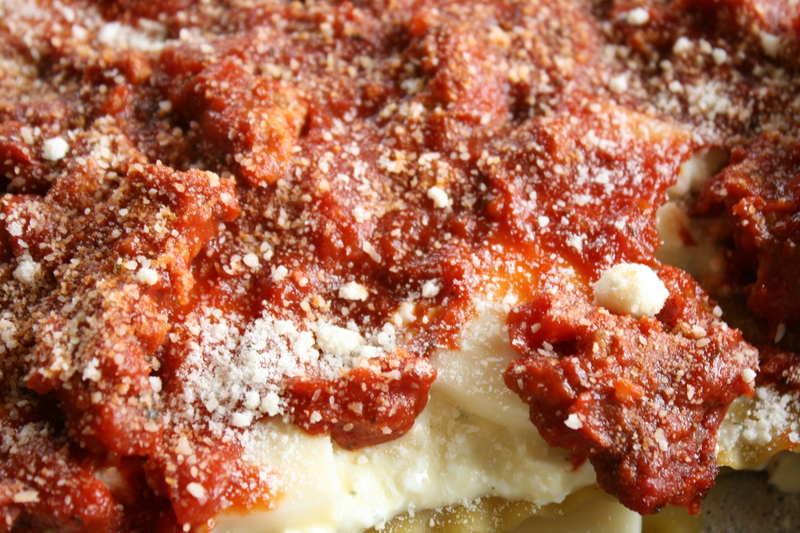 This lasagna is good anytime, not just on Halloween. 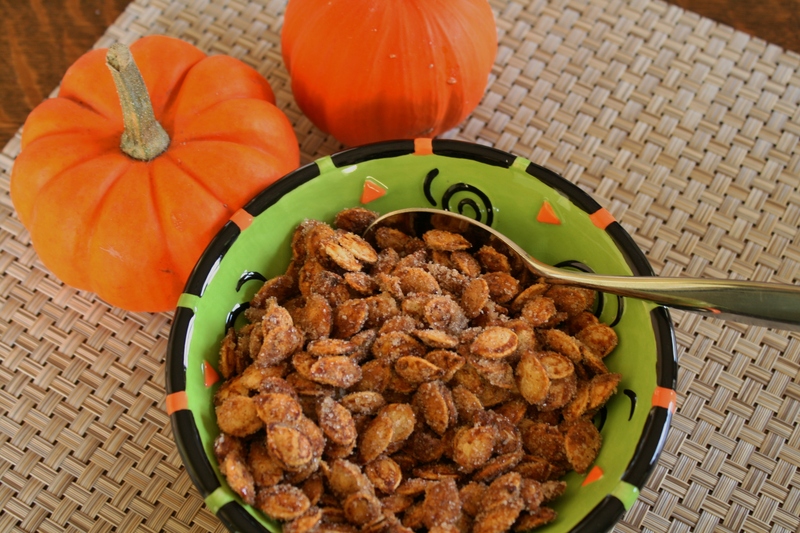 Try these for your little trick-or-treaters. They’ll hold off on the candy if they get to pull apart and devour a big spider!